BELIZE CITY, Thurs. 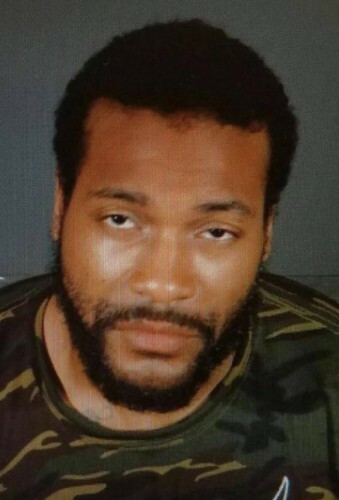 Oct. 6, 2016–Trenton Trevon Lovell, 27, a Belizean man who was on parole in Lancaster, Los Angeles, USA, was identified this afternoon as the man accused of shooting a veteran Los Angeles Sheriff Sergeant, Steve Owens, 53, stealing his patrol cruiser and then ramming it into another police mobile, resulting in the injury of another deputy. News reports published today indicate that Lovell had been booked at the Santa Clarita Valley Sheriff’s Station on Wednesday at 5:25 p.m., and held in lieu of $2 million. In an account posted yesterday by the Los Angeles County Sheriff’s Department, the Los Angeles County Sheriff’s Department (LASD) homicide investigators learned that shortly after noon, their Lancaster Station received a call of a burglary at 3200 block of West Avenue J-7 in Lancaster, where Lovell had been staying at an apartment with his sister. Sergeant Owen, a 29-year-veteran of the Sheriff’s Department, was the first of two responders to the residence, and he went to the back of the building, where he met the suspect, who allegedly fired at him with a handgun. Owen died later at the hospital. “A second deputy arrived on scene and encountered the suspect, who had entered Sergeant Owen’s patrol vehicle and was attempting to commandeer it,” the report said, adding that the suspect then rammed the assisting deputy’s patrol vehicle head-on before fleeing the scene on foot. The suspect then entered a nearby residence, which was occupied at the time by two teenagers, one of whom sent a text alert for help. The teenagers were successfully rescued and the suspect detained while trying to climb over a wall, the police report said. Police later revealed that the detained man, who was shot in his upper torso and later hospitalized, had been on active parole. A report carried by the LA Times said that Lovell was convicted in 2009 of robbing a USC community safety officer at gunpoint and was sentenced to six years in prison. Months before that robbery conviction, he reportedly pleaded no contest in July 2008 to resisting arrest and was given a 90-day jail sentence, according to Los Angeles County Superior Court records cited by The Times. He also ran into trouble in September 2015, when he pleaded no contest to driving under the influence of alcohol and causing injury to another person. Lovell also was ordered to complete a nine-month first-offender program and enroll in a drug and alcohol counseling program. He was scheduled to appear in court on Oct. 24 for a progress report, The Times reported. Lovell’s aunt, Deborah Matute, told the US news source that Lovell had been staying with her until earlier this year, when police showed up at her residence for a search. After the incident, she asked him to leave, indicating that she did not want any problems. Lovell was taken to the Twin Towers Correctional Facility in downtown Los Angeles, and is reportedly due in court Friday to respond to a Department of Corrections hold on his record.